NORTHAMPTON COUNTY – A former military vehicle is the newest truck in the Seaboard Volunteer Fire Department fleet. JOHNSTON COUNTY – A one-year-old girl died Wednesday when the car she was riding in ran off a Johnston County highway and overturned, authorities said Thursday. DAVIDSON – Nearly 24 hours after crews put out the fire inside a Davidson home, crime scene tape is wrapped around the yard for a death investigation. FAYETTEVILLE – Fifteen people were displaced Tuesday after fire destroyed an eight-unit building in Carriage Hill Apartments at 2109 Elvira St., the Fayetteville Fire Department said. WAKE FOREST – Wake Forest police have arrested a 19-year-old man in connection with a break-in at a fire station where three firefighters were sleeping. MAYSVILLE – Taxing the people will make it safer in Maysville — at least that’s how the town’s fire department sees it. 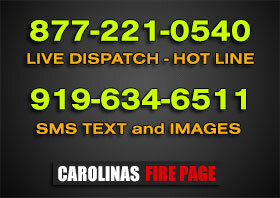 GASTON COUNTY – Firefighters responded to a report of a large fire on Forney Avenue near Belmont on Sunday morning. PENDER COUNTY – Citing a need to better utilize tax funds, the Pender County commissioners Monday began to look at eastern Pender County fire departments. CONCORD – The City of Concord’s Class 2 ISO fire rating will take effect June 1, and city staff want to remind commercial and industrial property owners to inquire with their insurance carriers about lower rates.